Snickers Clothing Have created a new and inovative flexible when working, tough on impact. 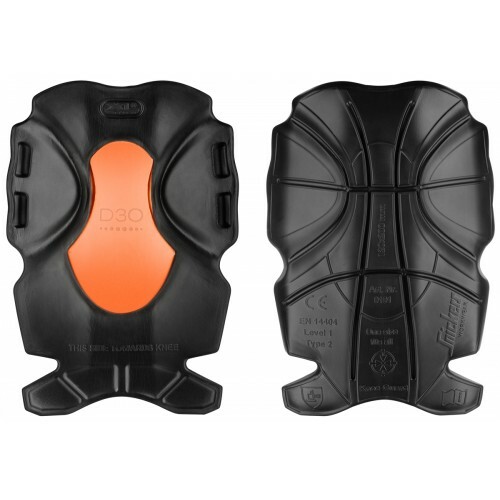 Active kneepads for active cratsmen, featuring shock-absorbing D3O® material for extreme protection and durability. Ready for the Snickers Workwear KneeGuard™ positioning system. EN 14404 (Type 2, Level 1). Extremely hardwearing and cut-resistant outer shell with advanced shock absorbing D3O® material on the inside that stifens up on impact. Keep their shape during hard work and last twice as long as other kneepads. Ergonomic curved design that follows the shape of the knee allows for ﬂexibility when walking, yet closes around the knee when bending down. Can be placed at diferent heights in the knee pocket to ensure correct position for maximum protection. Fits in the knee pockets on all Snicker Workwear trousers. Ergonomic design. Knees are not ﬂat. That’s why the 9191 XTR D3O® Kneepads feature an ergonomic, pre-bent design that make the kneepad close around your knee when kneeling down.